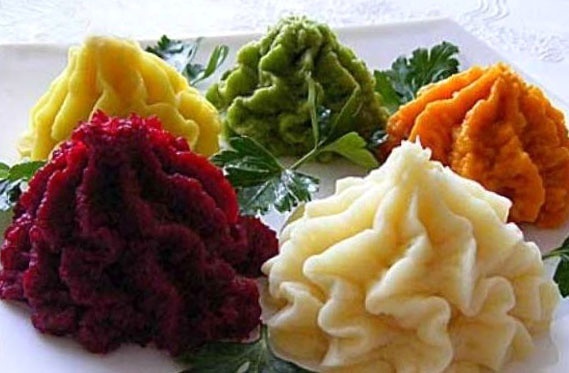 Habitual mashed potatoes can sparkle with new colors, if you make it a color, adding additional ingredients – spinach, carrot, pumpkin, green peas or other vegetables. Prepare cauliflower mashed potatoes is quite simple, and the principle of making "colorful" varieties are practically identical. Sliced potatoes boiled in warm water, after which the water is discharged. Additional vegetables are boiled or simmered until cooked separately from the potatoes. Then all the ingredients together in a bowl, added warm milk, butter and the mixture purlieus until then, until it becomes light and fluffy. The number of ingredients in all recipes are for 700-800 grams of potatoes. 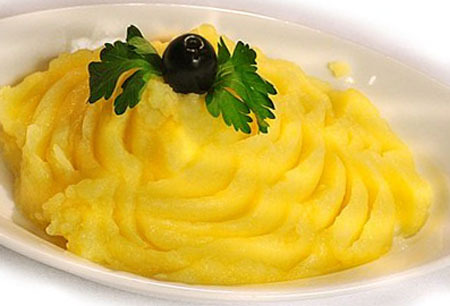 For making puree from such quantity of potatoes required 150-200 grams of milk and about 30 grams of butter. In order to obtain potato-beet puree beautiful rich crimson color, you need a little nice beet, huh weighing about 200 grams. Boil it in boiling water until tender, cool, peel and grate. Connect the beet mixture with the potato mash, add the warm milk (you can add a pinch of chili pepper), butter and whisk the raspberry puree. You can use another recipe for raspberry sauce: grated boiled beet squeeze juice and carefully stir it into already prepared mashed potatoes. This will allow without much effort to paint only part of the dish and before serving combine white sauce and red. 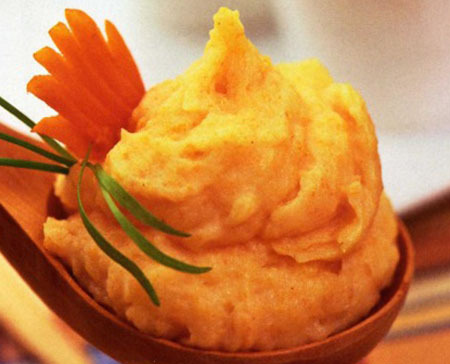 In order to prepare yellow mashed potatoes with pumpkin, 300-400 grams of pumpkin pulp cut into small cubes and cook in small amount of water with the addition of butter. Connect with potatoes, add milk and preroute. You can add nutmeg and a couple tablespoons of organic pumpkin oil this will enrich the flavor of the dish. When serving pumpkin-mashed potatoes you can sprinkle with pumpkin seeds. To prepare a bright yellow mashed potatoes with the help of turmeric – this spice has a very rich color and is often used for coloring dishes. Before you pour the milk in the boiled potatoes, add half a teaspoon of turmeric powder. 250-300 grams of carrots cut into slices, pour a small amount of a mixture of water and milk (ratio 1:1), add butter and simmered under a lid until tender. Then, without draining the liquid, RUB the carrots through a sieve or preroute blender. Connect with hot potatoes and stir, gradually add hot milk. You can boil chopped carrots, add to potatoes and blend together – but then the mashed potatoes will turn out to be heterogeneous, and orange speckled. Green mashed potatoes with spinach – quite a popular recipe. To prepare this puree 300 grams of spinach wash and dry. Pour into the pan a spoonful of vegetable oil, a clove of garlic cut into thin slices and fry. Add the spinach and cook over low heat, stirring constantly, until, until all the leaves will not wither. Grind the resulting mass in a blender, combine with potatoes, add butter and milk, season with ground black pepper and grated nutmeg. To serve this sauce can be sprinkled with pomegranate seeds. 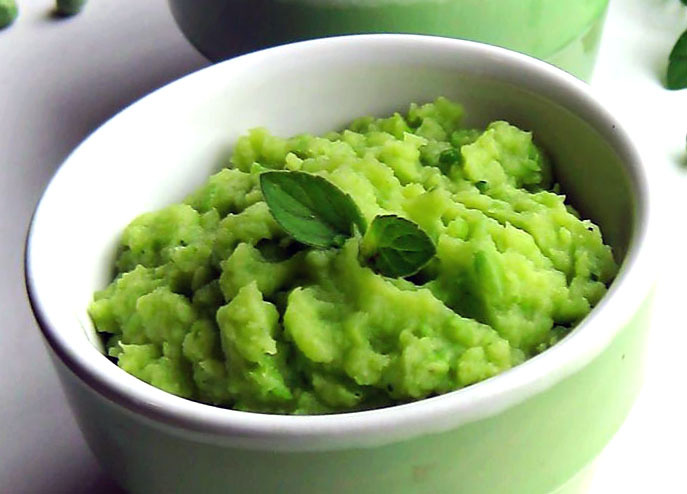 Make green mashed potatoes and peas. For this you will need about 100 grams of frozen green peas. It should be boiled in salted water for three minutes, after which quickly shift into very cold water so that the peas lost their bright color. The cooled peas pulirula and connects with potatoes. Puree is prepared by conventional techniques. You can serve it, garnished with mint leaves. You can make green mashed potatoes and parsley. Technology in this case will be different. A bunch of parsley (about 50 grams) wash, slice (along with twigs) and place in a small pot or ladle and pour the milk intended for puree. On low heat bring to a boil and cook for 3-5 minutes (the greens should be soft), then grind in a blender. Milk should be bright green. It is necessary to strain through a sieve to get rid of the remaining branches – and then pour the hot potatoes into a creamy puree.